Awe-struck visitors often call Lalibela’s underground churches the most impressive sight in all of Africa. They’re also arguably Africa’s most mysterious attraction. Ruins such as Cambodia’s Angkor Wat and Peru’s Machu Picchu spark intense speculation about how they came to be built – along with unabashed amazement at the ancients’ architectural abilities. Such destinations are firmly on tourist trails, with multitudinous hotels and diverse attractions to complement exploration of the ruins themselves. 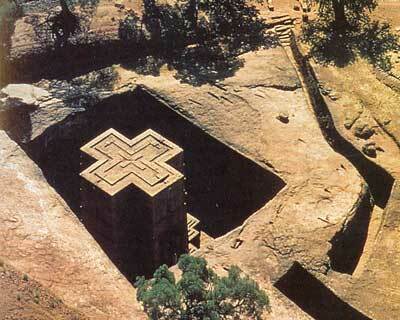 But Lalibela is far less widely known. Tourists occasionally boast of encountering no other visitors. Egypt’s pyramids are commonly considered Africa’s top constructed attraction. However, some who’ve eyeballed Lalibela maintain it’s even more memorable than the pyramids of Giza. My low-level flight from Addis Ababa to Lalibela crosses semi-arid countryside more reminiscent of Australia’s outback than the lush jungles of equatorial Africa. Long ridges extend like giant’s fingers over a harsh landscape. Some farming families’ homes perch precariously at cliff edges. Lalibela lures foreigners to Ethiopia, a regionally important Horn of Africa nation. It’s still visited mostly by intrepid backpackers and upmarket tourists (some on escorted packages). Mid-market tourism is in its infancy. The town is named after King Lalibela, a revered 12th-century monarch. Why were the underground churches built? The answer is a mix of oral history and local legend. The story goes like this. A prince was miraculously unhurt after being covered as a baby by a swarm of angry bees. It was an omen that he’d one day rule a vast swathe of what is present-day Ethiopia. However, his brother, the king, was jealous of Lalibela’s popularity and tried poisoning his younger sibling with a herbal potion. Against all odds, the prince survived. But, while drugged by the poison, he was taken to heaven to see a complex of churches. Angels instructed him to build similar structures on earth. So, when Lalibela became king he assembled a vast army of workers who built 11 churches in three clusters on a patch of land, roughly one square kilometre in size, alongside the town. The still-used complex remains sacred to just over half of Ethiopia’s 90 million people – followers of the Ethiopian Orthodox Church, one of the world’s oldest Christian denominations which traces its history to the fourth century. The churches occupy pits, roughly the size of squash courts, scooped from surrounding red earth to expose giant rocks. Each large church – a few of which are linked by tunnels – is, in fact, a big rock. Expert carvers painstakingly hollowed the rock to create big chambers complete with ornate religious sculptures. The end-result looks as if the churches were dropped into the pits that contain them. Though called “underground churches” the sky is visible above. Priests in ornate robes sit reading Bibles or praying quietly inside churches largely devoid of pews. Instead, the faithful stand – usually leaning against T-shaped sticks. Some churches are filled with religious art – including gory portrayals of the spearing or impaling of non-believers – as well as elaborately carved relics of gold, brass and wood. Priests show visitors goatskin bibles, with monks’ handwritten text in distinctive Amharic script interspersed with colourful religious art. Outside the churches, monks live in caves in the pit walls, relying for survival on donations from local residents and visitors, and spending their waking hours praying or reading religious texts. A monk invites me to inspect his small cave, signalling me to stand on a wooden box to peer into the dim interior. It is empty except for a little crate containing all his worldly possessions – and a skeleton in a corner. An English-speaking guide tells me later that the bones are those of another monk who died many years earlier. These bones, believed holy, were exhumed – and the monk keeps them next to him. On a mule’s back I make a seven kilometre journey to a small church and monastery called Na’akuto La’ab. It is one of several in the area – natural caves that, over the centuries, have had their mouths covered with stone and doorways constructed. Water drips from the cave’s roof into a jug. A priest tells me it’s holy water, capable of curing most ills. To reach the cave we cross farmland, following narrow paths between fields planted with teff (a staple grain common in Ethiopia). We stop to chat to friendly farmers who are keen to show off their few English phrases. The locals’ huts resemble those in much of Africa – except that they’re double-storeyed. It’s peculiar to parts of Ethiopia, with a different family occupying each level. My recalcitrant mule transports me back to Lalibela for repeat visits to several churches. Bete Medhane Alem is the world’s biggest monolithic church; Bete Maryam, according to archaeologists, is the oldest of Lalibela’s holy places; Bete Giyorgis is most visited and in best condition; Bete Golgotha is most sacred, containing a tomb believed to hold King Lalibela’s remains. But there’s something missing. There’s no-one trying to sell me postcards and guidebooks. Not yet. 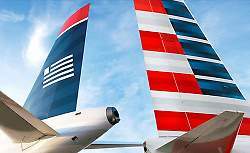 WASHINGTON, D.C. – National Press Club – With recent news of a merger between American Airlines and US Airways, the airline industry seems to be headed toward four “super-airlines” dominating the market. Recent mergers have consolidated brands and routes across the country, but passengers do not benefit. For the past three years of reports, US Airways has consistently ranked higher than American Airlines, based on the annual Airline Quality Rating conducted by Dr. Brent Bowen of Purdue University and Dr. Dean Headley of Wichita State University. Recent airline mergers may jeopardize gains in industry performance because it can take years for two airlines to successfully synchronize their systems and culture the researchers confirm. American Airlines planned merger with USAirways will create an oversized bastion of mediocrity that will serve the public in far poorer fashion, according to Dr. Brent Bowen, Purdue University professor responsible for the annual Airline Quality Rating (AQR) report. 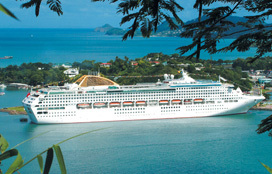 You are currently browsing the TOURIST LIFE TRAVEL & TOUR blog archives for February, 2013.